Submitted by sherry on June 19, 2008 – 3:22 p.m.
Hi, this is Felix Wong calling at 12:45 on Thursday, June 19th from Helena, Montana. Yesterday, I had a great day. I was feeling stronger than I ever had been all week and was climbing very well. In contrast, today has been pretty terrible. First I was descending and then a bird flew right into my spokes and I think the bird is dead. Sorry about that. Then shortly after that, I pulled my left hamstring and consequently I had to walk up from the next two divide crossings. And during that time I thought my ride was over. My left hamstring was really in trouble. I thought I popped a vein or something like that. Thank goodness that was it. I got back on my bike at maybe at about 10 a.m. this morning. I think I can manage. The hamstring actually feels a lot better. I’m going to press on and hopefully I can make it to Basin and sleep in a real bed and take a real shower for the first time in a week. I’m feeling pretty gross right now. I’ll talk to you later, OK bye. Submitted by sherry on June 20, 2008 – 12:20 a.m.
Hi, this Felix Wong calling at 9:20 now in Basin, MT. It’s Thursday, June 19th. It was just an incredibly difficult day. Every day there has been a difficult climb or multiple difficult climbs. But today was the mother of all climbs. The climb between Helena and Basin was just unbelievable. It was super long, super steep, very sandy, lot of cars passing and kicking up dust. Then at the top it was a very rugged, rough, technical climb and I basically had to walk both up and down that. Yah, man, uh. Then I got lost by a few miles. Then even on the road back down to Basin, even that was really rough. I took a spill once. Fortunately, didn’t break anything of my bike or body. I’m just glad to be in Basin now. I managed to find a motel. It’s not really a motel; it’s a disbursed collection of units in town. I got one of those units even with a washer and dryer. I’m going to wash my clothes. I’m probably going to have a late start tomorrow. I’m just going to enjoy my shower and that’s it. I’ll talk to you later. Bye. Pulled hamstring and had to walk up two divide crossings. For an hour, was thinking that might have been my race. Great paved downhill to Helena. Got lost by 3 miles – Park lake. Got lost after 4X4 road. 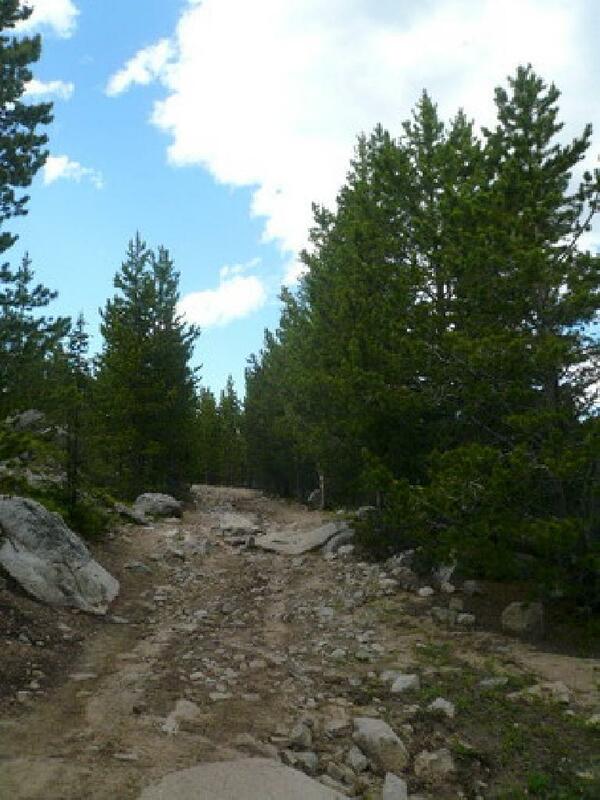 4X4 road – ruts, roots, boulders. Walked up and down. Two motorcyclists doing GD trail, including Don on a BMW with GPS. (The other rider was on a Suzuki.) They couldn’t get through at Meadow Lakes either due to snow. Saw them around 1:00 p.m., and three hours later saw them again as they made no more progress than I. In Basin, looked for (unsuccessfully) and then called the Merry Widow Motel. Got a recording saying the office hours were from 7am-7pm, but to call a cell phone number if there was an emergency. I decided that my situation was enough of an emergency, and called the cell phone. After eight or so rings, a young woman named Elizabeth answered the phone. She was the owner of the entire operation. I explained my situation and she was extremely gracious and opened up a rental house for me across the street without hesitation. She and her neighbor Pete then came over and gave me a salad with pine nuts, crackers, and an avocado. Phone calls to Tori, Mom and Dad.